The Pirates were excited to show immediate return on the Nate McLouth trade, starting 25-year-old Charlie Morton against his old team, the Atlanta Braves, on Wednesday night. Unfortunately, Morton's Pirate debut was rather abbreviated, as he threw just one inning against the Tomahawk Choppers and left the game with a hamstring injury. Luckily, the Pirates happened to have a pitcher available from last season's controversial trade of a veteran outfielder, so in stepped Jeff Karstens, who went on to allow four hits and one run in 4 2/3 innings en route to his third win of the season. 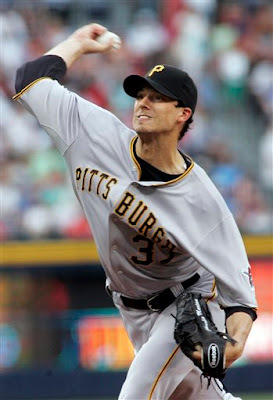 Karstens showed great control, throwing 43 of his 59 pitches for strikes. It was an encouraging outing for a guy who was recently banished to the bullpen. Sean Burnett, John Grabow and Matt Capps limited the Braves to only a two-out, ninth-inning homer by Garret Anderson, and the Pirates hung on for a 3-2 victory in front of 21,610. Andrew McCutchen was 0-for-5 with two strikeouts, lowering his average to .324, but the Pirates got just enough offense from Nyjer Morgan and Freddy "Don't Call Me Tony" Sanchez, who had two hits each. Adam LaRoche knocked in two of the three runs against his former team. The teams meet once again on Thursday with an early 1 PM start. Paul Maholm (4-2, 3.94) will duel with Javier Vazquez (4-5, 3.54). Following that, the Pirates have a Friday meeting with (drum roll)....DETROIT! That's right, Pittsburgh and Detroit, on Friday evening. Aren't those two cities "facing off" in another sport that night? It looked like we had a real-life Steve Nebraska on our hands.